An attractively situated and extremely private residential farm, comprising a substantial 6 bedroom period farmhouse, a 3 bedroom holiday cottage, a range of buildings and situated in around 38 acres of grassland interspersed with mature woodland with frontage to Hartoft Beck. A rare opportunity to purchase 3.58 acres of land situated adjoining Brigg Road, Filey and designated as an allocated site within the Local Plan for residential development. Allocated site HA26, housing density circa 30 to 40 houses. An excellent opportunity to acquire a rental portfolio of 5 double fronted cottages (1 x 3 bedroom, 4 x 2 bedroom), each with garden & parking. All fully let and producing a healthy annual income, situated in a convenient village only 1.5 miles from Malton. A substantial 4 bedroom period house, situated in a glorious elevated position near Danby and Castleton. The property comprises a substantial period farmhouse amounting to over 3,500sq.ft, a large range of buildings and in all is situated within around 63 acres. A beautifully located 6 bedroom former Vicarage set in delightful gardens and grounds together with a grazing paddock, in all situated within 4 acres. Attractive edge of village position between Guisborough and Saltburn by the Sea. Superbly siutuated 6 bedroom period property in grounds of around 1 acre. Located in the sought after Deepdale area near the South Cliff and situated in an outstanding elevated position within beautifully private gardens and grounds. A versatile mixed use residential and commercial property in 5.6 acres, comprising a spacious house in lovely gardens and grounds offering bed and breakfast accommodation, two well stocked day ticket coarse fishing lakes and an excellent location close to York. A highly versatile & beautifully renovated period property consisting of principal house with adjoining cottage & separate holiday cottage set within extensive, landscaped grounds in a picturesque Wolds village. A substantial & beautifully renovated, Grade II Listed Georgian property currently operating as a highly successful country guest house with 11 letting rooms & planning consent for further development. A village residential smallholding with development potential comprising four bedroom Georgian farmhouse, extensive range of substantial, traditional buildings & land extending to approximately 8.4 acres in total. An increasingly rare opportunity to acquire a prime residential development site located within a sought-after conservation village with full planning consent for the creation of 7 superb dwellings. A substantial, stone-built, five bedroom family house set in mature grounds approaching half an acre in one of Malton’s most exclusive addresses. Spectacularly located four bedroom residence enjoying unparalleled views & occupying a superb elevated site within landscaped gardens, paddocks & modern general purpose building. In all approximately 8.93 acres. A substantial, four bedroom former Vicarage set within mature grounds extending to nearly 1.5 acres. A superb & versatile lifestyle property comprising stone built farmhouse with adjoining holiday cottage/annexe, CL caravan site, range of outbuildings & good quality paddocks. In all approximately 10.5 acres. LEISURE / HOLIDAY PARK DEVELOPMENT OPPORTUNITY IN A MATURE WOODLAND SETTING IN THE NORTH YORK MOORS NATIONAL PARK. Full planning consent for 15 holiday accommodation units comprising; safari tents, timber lodges and tree tents plus associated reception/ amenity buildings in upto 83acres woodland. An exciting opportunity to create an incredible family home of over 5,500 sq.ft from a particularly substantial Grade II Listed granary barn, the conversion of which has already reached an advanced stage. 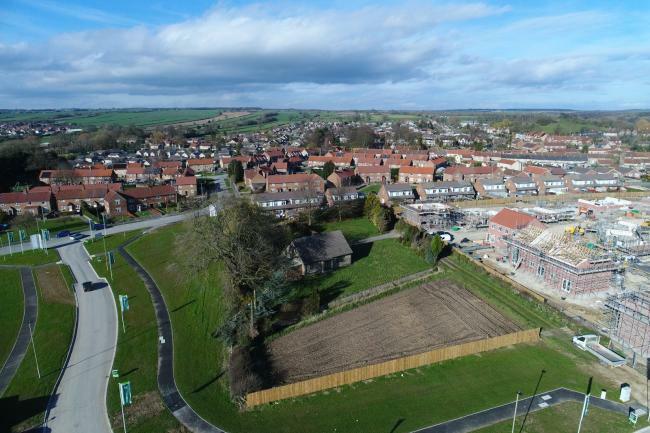 An increasingly rare opportunity to acquire a prime residential development site of 0.85 acres located within this attractive Market Town with Outline Planning Permission granted for the creation of 7 dwellings. An attractive and privately situated rural property situated on the southern edge of the popular village of Rosedale Abbey. The property comprises a 4 bedroom house (subject to a local occupancy or agricultural occupancy clause), outbuildings and stables and 8.8 acres. A compact residential and equestrian smallholding which previously had been operated as a commercial pig rearing unit and now comprises a well presented three/four bedroom bungalow, a large range of farm buildings, stables and stores and in all the property is situated in approximately 5.58 acres. Showing 26 to 50 of 251 Properties.